(Phys.org)—When Ovadia Lev, Professor of Environmental Chemistry and Health at The Hebrew University of Jerusalem, and his research team developed a new coating technology a few years ago, they thought it was an interesting outcome of their research in hydrogen peroxide solutions. However, they weren't sure what to do with it until they met a team of researchers looking for a simple way to synthesize new lithium-ion battery anode materials, such as graphene-tin oxide composites. "For several years now, my laboratory, in collaboration with my former postdoctoral student and current research partner, Dr. Petr Prikhodchenko, has been researching sol-gel chemistry in hydrogen-peroxide-rich solutions," Lev told Phys.org. "One of the outcomes of this research was a technology to coat particulates by nanometric metal oxide dots. We started looking for an appealing demonstrating application that would bring to light the advantages of our coating procedure. In a way, we had a medicine and were looking for a suitable illness. "Then, my laboratory became involved in a collaboration between Israel and Singapore supported by the Singapore National Research Foundation under its CREATE program: Nanomaterials for Energy and Water Management, and our Singaporean partners soon realized that lithium-ion battery anodes can greatly benefit from the flexibility and simplicity of our particulate coating approach." Battery researchers find graphene-tin oxide attractive as an anode material in lithium-ion batteries for three main reasons: it has a high theoretical charging capacity, the graphene has high conductivity, and the graphene oxide and tin oxide nanocrystals are in close contact. The problem is that synthesizing these composites, which involves coating an ultra-thin layer of tin oxide nanocrystals on a sheet of graphene oxide, has previously been an expensive, high-temperature process. But by using the new coating technology, the researchers found that they could synthesize graphene-tin oxide composites at room temperature, without complicated infrastructure, at a reduced cost, and in an environmentally friendly way. Lev, Prikhodchenko, and their coauthors, from institutions in Israel, Russia, and Singapore, have published their study on the improved synthesis method in a recent issue of Nanotechnology. As the researchers explain, the new particulate coating technology uses hydrogen peroxide to induce the formation and deposition of tin oxide nanocrystals on graphene oxide. In a previous study, the researchers found that hydrogen peroxide promotes the formation of a tin oxide coating through several chemical mechanisms, such as promoting bonding and preventing particle aggregation. Using this coating technique, here the researchers achieved an average tin oxide nanocrystal size of just 2.5 nm, which is significantly smaller than the 4 nm size previously achieved. The small size decreases the deformation caused by lithium alloying, which in turn improves charge/discharge cycling performance. To demonstrate the performance of the composites in batteries, the researchers used the graphene-tin oxide to prepare two types of lithium-ion anodes: graphene oxide with a tin oxide coating, and graphene oxide with a coating of tin oxide and tin. Both anodes exhibited a high capacity (starting at around 1500 mAhg-1) that exceeds the predicted theoretical capacity, although it dropped to about 700 mAhg-1 after 90 cycles. 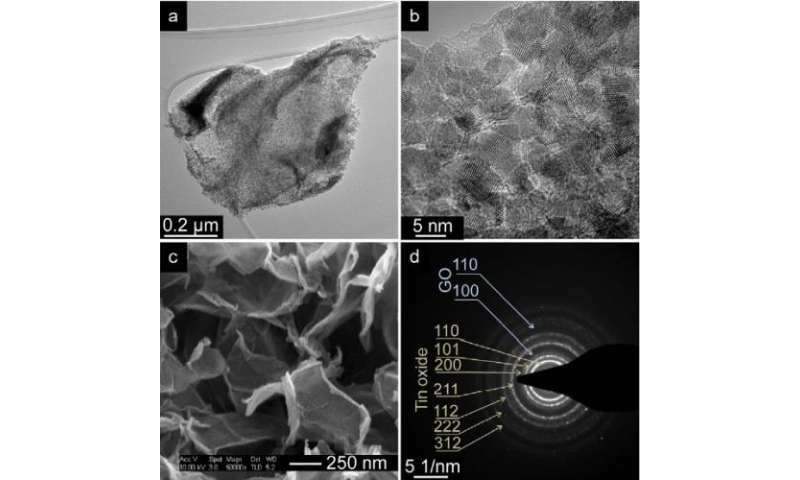 Both anodes also exhibited a stable charge/discharge cyclability due to the intimate contact between the conductive graphene and very small tin oxide nanocrystals. The composite without tin exhibited a higher charging capacity but slightly lower stability after extended charge/discharge cycling compared to the composite coated with both the tin oxide and tin, which the researchers attribute to a difference in thermal treatment rather than to the difference in composition. Lev explained how the graphene-tin oxide anodes fit into the big picture of current lithium-ion battery research. "Lithium-ion batteries are developed in several parallel directions, targeting improvements in charging capacity, specific energy density, charging and discharging rates, battery life and charge fading, battery safety, and above all battery cost, which calls for a cheap manufacturing process from cheap raw materials," he said. "Each application of chargeable batteries should have a different optimization target-function resulting in a different cell composition. For example, charge fading is tolerated differently in toys and smart phones, and the two different consumer populations will be willing to pay differently for additional battery life. "Our new approach targets only two of these aspects: Superior charge capacity, which is over twice that of graphite anodes, and low cost, which is manifested in cheap raw materials and wet chemistry processing." In the future, the scientists plan to expand their research to other electrode compositions that may benefit from hydrogen peroxide sol-gel processing. Battery researchers notice graphene-tin compound enticing as Associate in Nursing anode material in lithium-ion batteries for 3 main reasons: it's a high theoretical charging capability, the graphene has high physical phenomenon, and therefore the graphene compound and tin compound nanocrystals.